Mini SUV’s in India are grabbing more attention than we ever thought it would. People in India want more for less at the same time. Indian automotive industry is giving just that. There are a healthy number of sub 4 metre SUV’s here which make it really hard for a common man to choose the best. 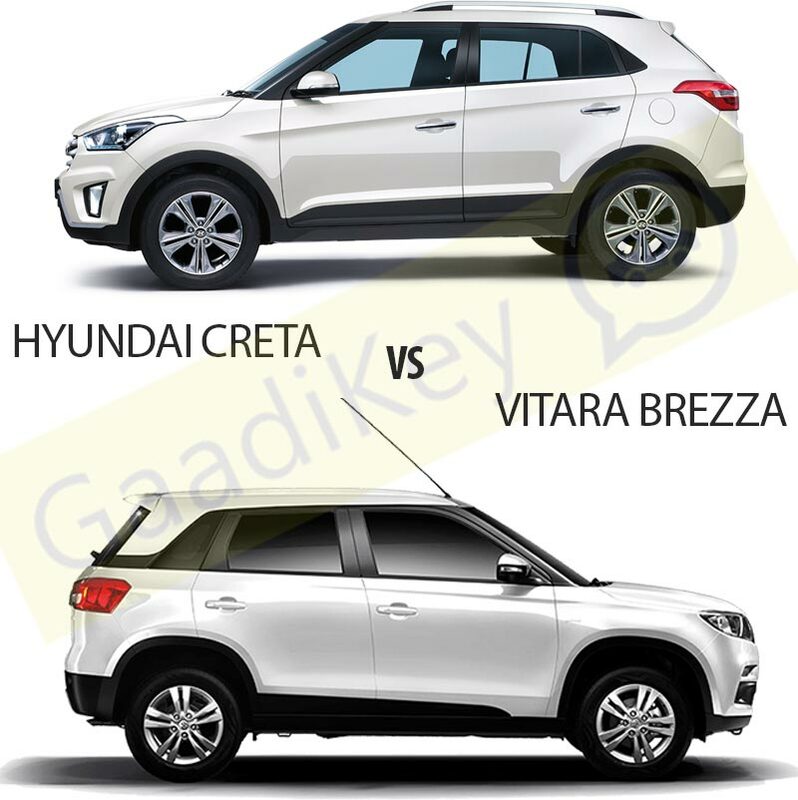 Hyundai Creta has been a fantastic bet since the time it was launched. Maruti’s answer to the Creta came through with the launch of the new Maruti Vitara Brezza which stood as the biggest competition against the segment leading Ford Ecosport and the successful Hyundai Creta. 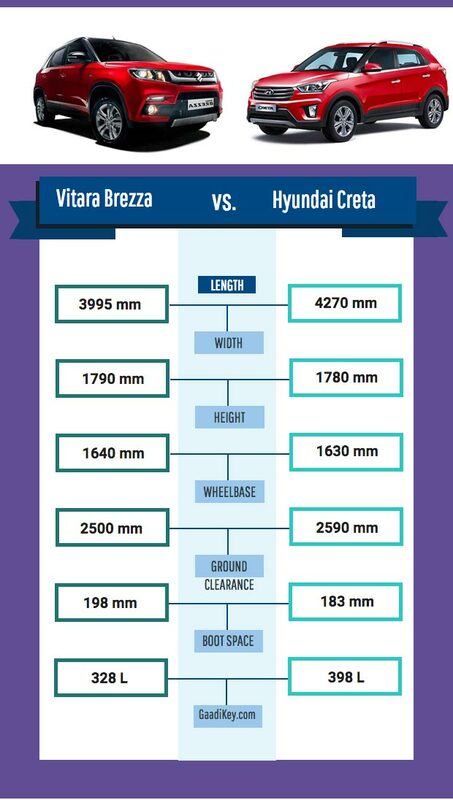 The comparison of the Vitara Brezza and the Creta will help you understand and know better about both to make a choice. Hyundai has adopted their Fluidic deisgn to play a role with the Creta. Creata has a handsome looking front fascia with hexagonal chrome grille which looks rather neat. Fog lamps are vertically placed and surrounded with black covers. Creta gets a wide bonnet and the headlamps come with DRL’s for better visibility. Side profile is borrowed from Hyundai’s bigger SUV, Santa Fe. The side profile has character-ed lines angled towards the rear, roof-line and the roof rails are tapered to give it a distinctive look included with wrap around tail lamps and diamond cut alloys. Vitara Brezza’s design is bold with a single slated, chrome plated front grille. Large honeycomb air dam, lower set turn indicators and the neatly designed bonnet make it look different compared to the Creta. Tapered roof-lines and roof rails are well noticed from the side profile. Black cladding around the car gives it a very SUV look. Vitara Brezza also gets dual tone colors unlike the Creta. The Hyundai Creta has interior layout similar as seen on the Verna. Creta comes with keyless entry and start/stop button, supervision cluster, auto headlamps and wipers, five-inch touch-screen infotainment system with CD/MP3/Radio/USB/ AUX-in and Bluetooth connectivity, steering mounted controls, FATC with cluster ioniser, 1GB internal memory, navigation, climate control and rear AC vents which give it a premium feel. The Maruti Suzuki Vitara Brezza’s interior has been borrowed form the Maruti Baleno hatchback and some off the Maruti Swift. The cabin has a centre fitted console with piano black finish to give it an up market look. The centre console features Smartplay infotainment system with Apple CarPlay and cruise control. Mapcare navigation, three-spoke multi-function steering wheel, reverse parking camera, voice command function and Bluetooth connectivity are added features to the Vitara Brezza. Hyundai Creta come with Six airbags in the top-end model with two airbags standard from base variant. Anti-lock Braking System (ABS), Electronic Brake-force Distribution (EBD), Vehicle Stability Management (VSM), Electronic Stability Control (ESC), Hill-start assist control and Rear parking camera add up to other features of the Creta. While the Brezza gets ABS with EBD, keyless entry, push button start/stop, etc. The Hyundai Creta 4270 mm long, 1780 mm wide, 1630 mm high and comes with a wheelbase of 2590 mm. The ground clearance of 183 mm is lower than the Brezza’s and boot capacity of 398 litres is 70 litres more than that on the Vitara Brezza. The Vitara Brezza is 3995 mm in length, 1790 mm in width, 1640 in height and comes with a wheelbase of 2500 mm, ground clearance of 198 mm which gives it a good advantage while taken off-roading and boot capacity of 328 litres, that’s lesser than the Creata’s 398. The Hyundai Creta is available in three engine options: a 1.6-litre gamma dual VTVT petrol, 1.4-litre U2 CRDi and 1.6-litre CRDi diesel. The 1.6-litre, four-cylinder Gamma Dual VTVT petrol engine gives a power output of 123 bhp and 154 Nm of max torque. 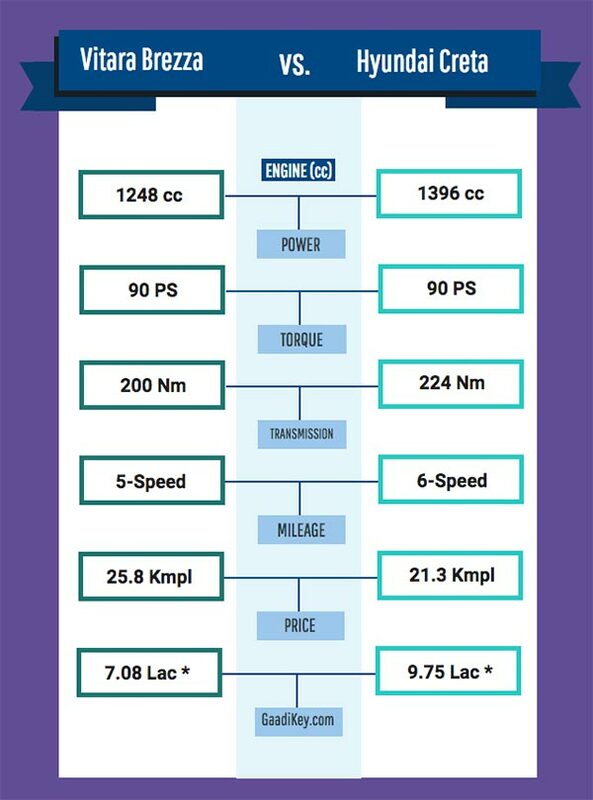 The 1.4-litre U2 CRDi diesel motor makes a total power output of 90 bhp and 224 Nm of torque and the powerful 1.6-litre U2 CRDi diesel engine churns out 128 bhp and maximum torque of 265 Nm. The Maruti Suzuki Vitara Brezza comes with the same fuel-efficient 1.3-litre DDiS 200 Multijet diesel engine seen in the Swift, S-Cross and Baleno which is capable of producing a max power of 88.5 bhp and a peak toque of 200 Nm at 2,000 rpm. 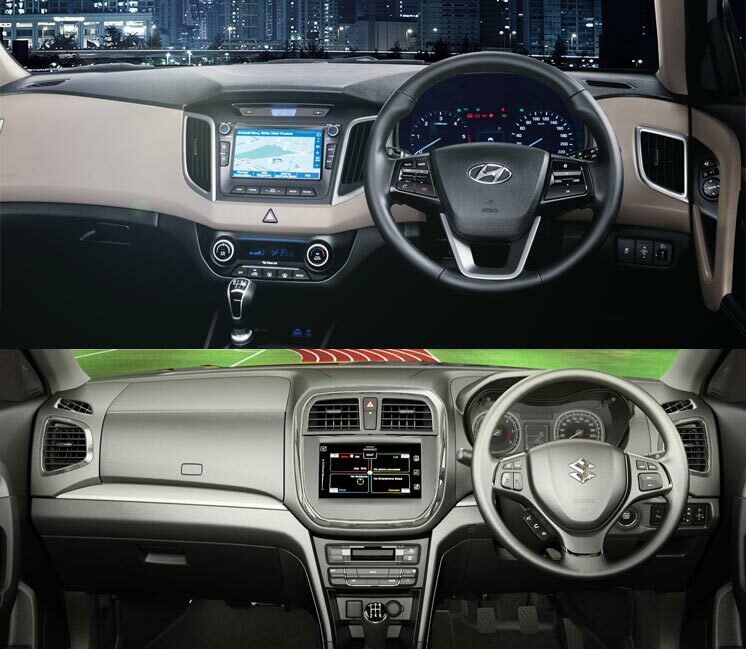 Two transmissions being offered on the Creta are a six-speed manual and a six-speed automatic. The 1.6-litre dual VTVT petrol has a claimed fuel efficiency of 15.29 kmpl, the 1.4-litre U2 CRDi diesel gives a healthy 19.67 kmpl and the 1.6-litre CRDi diesel has a fuel efficiency of 21.38 kmpl. Hyundai Creta comes with a 55 litre fuel tank capacity. Low powered engine from the Brezza can give a great mileage of 24.3 kmpl which is more than Creta’s claimed 21.38 kmpl in the 1.4-litre CRDi diesel. The engine will come coupled with a five-speed manual transmission. A petrol variant with an option of AMT is known to be launched in April 2017. The Hyundai Creta is being sold in 10 variants from 1.6 Base Petrol to 1.6 CRDi SX+ AT. The base variant is priced at Rs. 8.87 lakh and it goes up to Rs. 13.98 lakh for the top variant (ex-showroom prices, Delhi). Maruti Suzuki Vitara Brezza is priced between Rs.6.99 lakh and Rs.9.68 lakh. (ex-showroom Delhi). For more automobile news, like us on Facebook and follow us on twitter while subscribing to us on YouTube.